This is a dish that’s always a hit in our house with both adults and kids. It’s quite simple to make and so tasty. And if you make a bit extra, the meatballs are great for a tasty breakfast the next day! 1) Heat olive oil in a large pot and add onions and garlic and heat until softened. 2) Add tomato puree and stir and then add chopped tomatoes plus 2/3 of a can of water. 3) Add in red wine, balsamic vinegar, paprika, basil, oregano and parsley. 4)Turn heat to low and cover and leave to simmer while you prepare meatballs. 5) In a large bowl mix meat, salt & pepper, the cheese and the egg. Use your hands to ensure everything is completely mixed. 7) Heat some more olive oil on a frying pan to a high temperature (don’t burn the oil) and place the meatballs on. 8) Only fry them for 4 minutes and turn them half way through. This is just seal them so they hold their shape and moisture when in the sauce. 9) Get a hand blender and blitz your tomato mixture until it is smooth. Then carefully add your meatballs to the sauce. Again cover and leave to simmer for 20 mins. 11) When pasta is boiled pour into a colander and rinse under cold water until all the starchy water is gone and clear. Pour a fresh boiled kettle of water over the pasta to reheat it. And now it will not be sticky pasta. 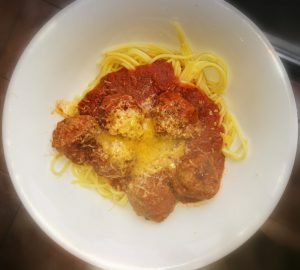 12) Serve pasta, then meatballs and cover with sauce and a sprinkle of grated cheese.